Registrations are essential. Collection events are scheduled on demand for service based on the volume of chemical registrations received by region and state across Australia. ChemClear undertakes 2-3 state collections and several regional collections annually. 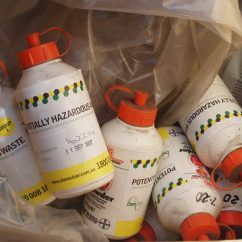 Waste holders are encouraged to take an inventory and register their chemicals as soon as possible. These chemicals will help build a requirement to schedule a collection in your region. ChemClear schedules a collection once the volume of registrations meets a certain amount that makes it efficient for a collection run. Regional collections run regularly in NSW, VIC and TAS. State collections occur on a 2-3 year cycle. Some states are serviced more than others due to stronger demand for the ChemClear service. If you’ve missed the booking deadline for one of our chemical collections, still register as we are always looking forward to the next collection. A permanent drop-off collection site is available for waste holders in the Sydney and surrounding region. Collections are held every second Tuesday of the month at a secure location in the St Marys area. Register your chemicals on our Registration Page or call our hotline on 1800 008 182. A permanent drop-off collection site is available for waste holders in the Melbourne and surrounding region. Collections will be held every second Tuesday of the month at a secure location in the Laverton North area.